Chocolate Coconut Tarts. In our house, my husband is the chocolate lover. Almost all the chocolate recipes I create are for him. For example, the 3 Ingredient Chocolate Bars or the Super Moist Flourless Brownies. 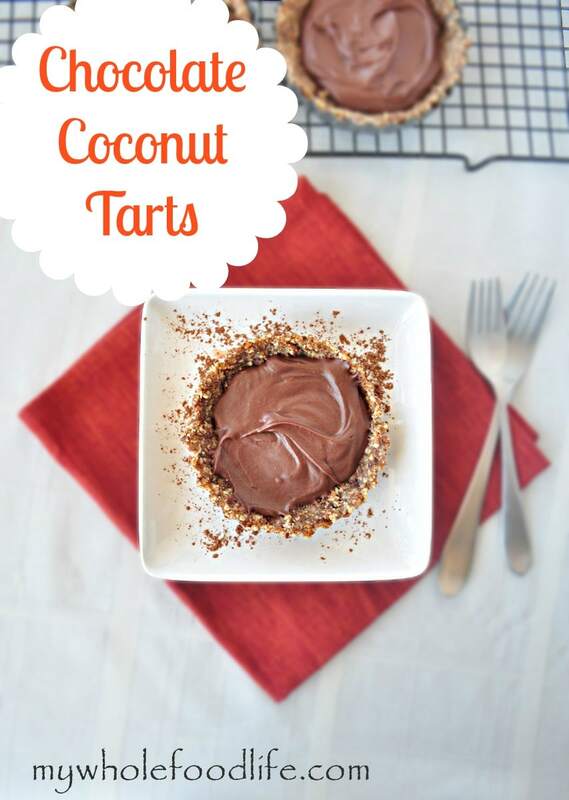 These chocolate coconut vegan tarts are perfect for any chocolate lover. They only take minutes to make, but they look so fancy. Imagine a decadent chocolate ganache so rich and delicious! That is what this chocolate filling is like. I used coconut butter so the filling literally melts in your mouth. 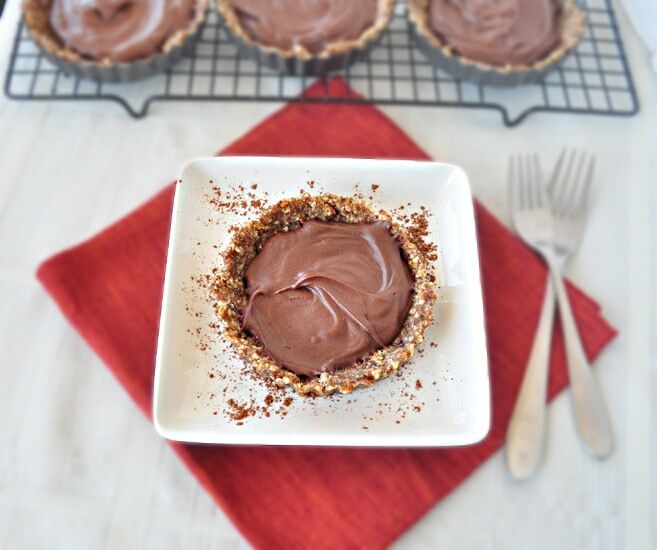 Since these chocolate coconut tarts are so rich, just couple bites will satisfy you. I got 4 small tarts out of my batch, but if you have a full size tart pan, I think it would work as well. Looking for more vegan tart recipes? It looks fancy, but simple to make! In a food processor , combine the pecans and flax. Once those are ground up, add in the remaining ingredients for the crust. You will start to see the mixture come together to form a dough. If it looks a little dry, you can add a touch of water, but be careful not to add too much. Press the dough into greased tart shells . Once all the shells are done, place them in the fridge while you make the filling. In a blender or food processor , mix the ingredients for the filling. Once the filling has come together, spoon it into each tart. Then store the tarts in the fridge. After the tarts have been in the fridge for a while, the chocolate filling will harden up to a fudge like consistency that is out of this world. If you don't have a powerful food processor, you can soak the dates in water for 30 minutes before you intend to use them. It will make them much softer and easier to process. These look wonderful! The filling looks silky smooth like a mousse. Do you have to melt the chocolate chips before adding to the food processor to get the chocolate this smooth? Can't wait to try these! Thanks Tracie! I didn't melt the chocolate at all. The filling is not really like a mousse though. It is when you first make them, but it firms in the fridge to give it more of a fudgey ganache feel. Melissa, these are LOVELY! Also, I love your chocolate molds!!! Happy Sunday! Thanks Colleen! Same to you! You are far too creative for your own good! ;) I used to hate coconut but I've recently discovered that I absolutely love it. I'm all out of coconut butter and have been meaning to make more so this is the perfect incentive. Can't wait to give this recipe a try! Thanks Robin! I hope you enjoy the recipe. They look wonderful! Can I use date sugar? Thank you! You might be able to, but it might be a little grainy in texture. Made today! I subbed almond butter for the coconut butter. Still very chocolatey! Good idea! Glad you liked it. Bought the ingredients to make this and realized I only have a Pyrex pie container, no tart shell. Will that work? Thanks! That might work? Keep me posted on how it turns out! Could this be made as one whole tart (pie) instead of individual tartlets?